Stadium Merdeka was officially opened to the public by YTM Tunku Abdul Rahman on August 30, 1957, just in time to host the most important event in the history of the country, the Declaration of Independence on August 31, 1957. Stadium Merdeka recorded another memorable event in our nation‟s history on September 16, 1963. The Proclamation of Malaysia, with the inclusion of Sabah and Sarawak, had opened a new dimension to the unity and multi racial understanding; the very foundation and strength of modern Malaysia as we know it today. Stadium Merdeka has served the country well. The Stadium had played host to many significant events such as 1965 and 1971 South-East Asia Peninsular Games, the 1975 Hockey World Cup and Sea Games in 1977 and 1989. Merdeka Cup Football tournaments were also held at the stadium annually from 1957 to 1995, where the stadium stood witness to some of the greatest matches ever played by national team. At the international scenes, Stadium Merdeka also played host to the Mohamed Ali-Joe Bugner showdown for the world heavyweight title in 1975. Cliff Richards, Scorpions, Michael Jackson, Mariah Carey, Linkin Park, Jennifer Lopez, Jacky Cheung, Big Bang, Avril Lavigne, Mahir Zain, Lee Hom and Metallica among the international performers had also performed there. The stadium has survived the test of time throughout the years. Today the stadium is still „the place‟ for local and international events across the spectrum; from sporting events to national-level functions. 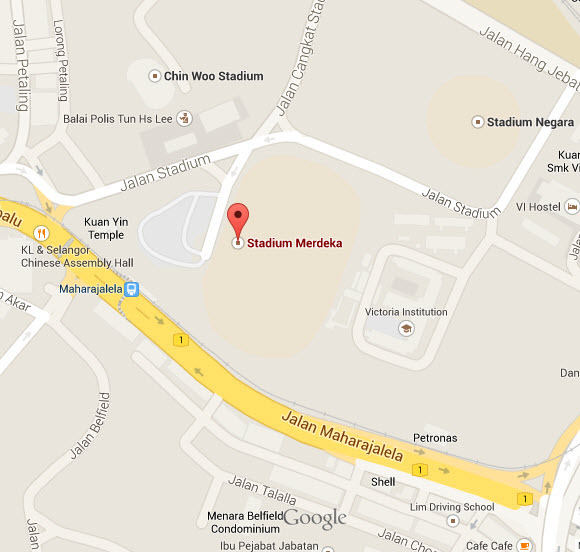 Stadium Merdeka is suitable for cultural shows, concerts, football matches, family days, exhibitions and corporate events. 2. In-House Provision: Open air only.